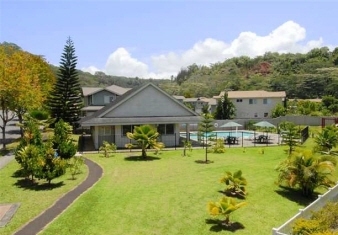 Wonderful Mililani location overlooking a hillside forest and valley stream. This is a second floor, three bedroom, two bath corner property with two parking stalls in a quiet and private area of Launani Valley. New interior paint and brand new carpet just installed. Considered to have some of the nicest amenities in all of Mililani including: tennis, basketball, playground, streamside walking path and a private park recreation area. Two assigned parking with guest parking available.